We make it easy for merchants to offer online and mobile payments, while taking away the burden of integrating with multiple payment providers. A single entry point for processing payment requests. Using PaymentsOS, you communicate through a single API rather than setting-up communication channels to multiple payment providers. 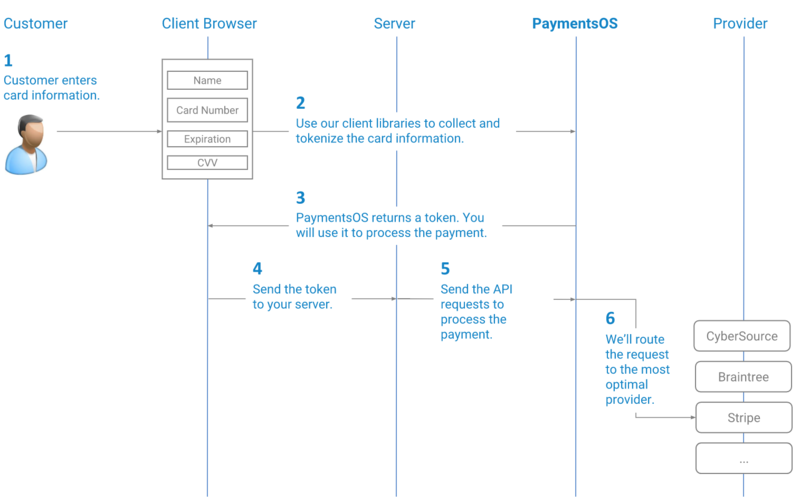 Functionality for dynamically routing a payment request to the most optimal payment provider. Dynamic routing is based on business rules such as fees, acceptance rates, availability and response times. The ability to analyze your payments performance. Using the insights gained, you can then make informed decisions about tweaking your business rules to further reduce abandonment rates and card declines and improve your bottom line. The ability to minimize your PCI compliance scope. PaymentsOS reduces the burden of PCI compliance via secure credit card collection and tokenization. Let&apos;s take a birds-eye view of the steps needed to integrate with PaymentsOS. Looking down on the integration landscape, you will notice a total of 4 steps: configure, develop, test and deploy to production. Add the providers you will transact against and define the business units that will accept payments. See Setting-up PaymentsOS. Write client-side code for collecting a customer&apos;s card information and server-side code for handling all required transaction flows. Once you are familiar with the basics of a client-side and server-side implementation, move on to read about the other payment flows and operations that we support. Verify that your integration works as expected. As a best practice, you should configure, develop and test your integration in a development and staging environment before going live. Review our guidelines for setting up your environments and learn how to use the mock provider for running tests. We also summarized the test cases you should execute before moving to production. PaymentsOS provides both a test and live environment for testing your integration and processing payments. To gain access to the live environment, you must activate your account first. Click here to activate your account. This is the moment when your efforts come to fruition! So, once you&apos;re confident that your setup and integration is production-ready, deploy your code to the production environment and start live transactions.